PULASKI COUNTY, Va. - Four people were hurt in a seven-vehicle crash on I-81 in Pulaski County Wednesday afternoon. It happened around 3:15 p.m. on I-81 South at mile marker 94. It shut down I-81 South for hours. State police say a tractor-trailer traveling north sideswiped a tractor-trailer traveling in the adjacent northbound lane. The impact of that crash caused both tractor-trailers to run off the left side of the interstate and into the median. The first tractor-trailer came to a stop in the median. 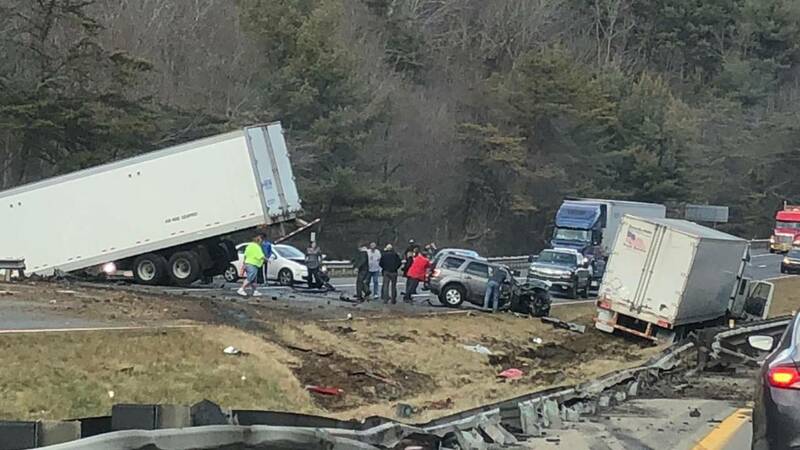 The second tractor-trailer continued across the southbound lanes of I-81, caused five passenger vehicles to crash, and then the tractor-trailer went over the guardrail off the right side of the southbound lanes. The driver of the first tractor-trailer, Miriam U. Campbell, 32, of Gastonia, N.C., was wearing a seat belt and was not hurt. She is charged with reckless driving. The driver of the other tractor-trailer was wearing his seat belt and was not hurt. A female adult passenger in one of the five passenger vehicles was flown to Carilion Roanoke Memorial Hospital for treatment of serious, but non-life threatening, injuries. Two other people among the five passenger vehicles were treated and released at a nearby hospital for minor injuries. A fourth person was treated at the scene for minor injuries.